Posted on May 18, 2009 at 12:31 pm. I didn’t design this site, nor was I involved in its development whatsoever. I did happen to notice several issues that shouldn’t be there given the nature of the site (design college). These are pretty simple mistakes and simple catches. So starting from top left to bottom right: The first thing I noticed was that Chance’s name had a space before it so it wasn’t flush with the title below. It should all be flush left. The second thing I noticed was that the majority of the “// read more” links had a space after the hashes, the alumni and instructor featured area did not have a space after the hashes. Thirdly, under “events”, the more is all in caps, but everything else is not in caps. The fourth thing I caught (and this is something to consider when writing – make a style guide) is that “command g” was formatted three different ways. The last thing is that the “click here” call to action was not formatted as an obvious link. It was not in another color nor did it have hashes. 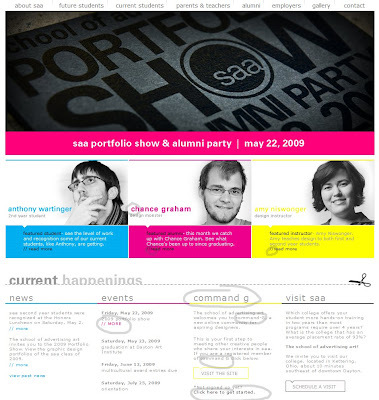 It’s very important to proof work, especially if it’s going live, and especially if it’s a design college. What do they teach their students? Well I turned out all right!